Classified 4 stars, The Villa Mont Bogon, installed on 2000 m ² of garden was entirely renovated in a contemporary style. With breathtaking views of the mountains, it promises beautiful moments with family or friends. It can accommodate up to 7 people. Note that the small household appliances needed daily and linen are provided. This maision comfort seduce you with its equipment and interior with tasteful and warm decoration. Enjoy stunning views of the mountains and the facilities of the terrace and garden. Children are welcome. The house has two bathrooms, one of 2006 and the other has been completely added, it is brand new with Italian shower, double sinks and wooden boat deck to the ground. A beautiful home and location. We only stayed one night but wished we could stay at least a week. The home has everything you need and is centrally locates to enjoy the country and go i to Annecy for all of the activities. Annecy itself and the surrounding area is absolutely stunning and well worth a visit. The villa is part way up a mountain and has a nice view over the valley however there is a noisy road at the bottom. There is a neighbour who seems to breed dogs and had several puppies outside barking at all hours. On booking I was asked if I wanted to book a cleaner for €**. As we were only staying for four nights I declined. On checkout day the owner arrived and told me that we would have to pay her €** as the shower had not been cleaned and the kitchen floor required mopping. She told me that as we declined the cleaner that it was our responsibility to clean the villa to a state where it could then be used by another party. We had cleaned and tidied the villa to a good standard but the owner was looking for issues to raise. I feel it is wrong to expect the guest to pay a further €** (when the cost to stay is high as you can see from the website) or to clean the place to a perfect state whilst on holiday. The owner explained that this was common in France and that her charge per night is cheap for the area. I disagree! We have stayed at eight other holiday rentals in France and have never had to pay extra for cleaning! Especially when she asked me to help her carry in a large box of cleaning equipment. It just felt as though she was trying to get more money from us for a job she would do herself. The house itself is nice and well decorated but personally I would say not great for young children. There is a lot of glass around which would be easily broken by a running child. The coloured glass hanging lights look lovely but my three year old son could reach them and was obsessed with them. I'm assuming if they had been broken that we would've faced a high fee. Also at the top of the stairs there are two very thin wires to stop children falling down stairs. They are suppprted by a flimsy piece of plastic which if tested would not be much use at preventing a child falling. The house is nice but not ideal for young children, the area is stunning and is well worth a visit but there are many more properties for a similar price which overlook the lake and would be our main choice for our next visit. For me the issue regarding cleaning left a sour taste. We will not be returning to this villa and for the above reasons would not recommend it to friends/family. I am sorry for our missunderstanding. We let people decide if they prefer to pay the cleaner or clean the house themself. I just want to say that the first big road is 2 km down the house and that there is no dog breeding around the house! My husband and I stayed for 10 days in September. The weather was beautiful and the views stunning. The house was very well kitted out - we particularly enjoyed a few (very competitive!) games of table tennis. A very relaxing property in a peaceful area, furnished well, lots of outside areas to eat or to lounge. Hot at the front of the property and nice and cool at the back. There is a barbecue you can use - make sure you clean it for the next customers. There is a charge for cleaning at the end of your stay or you can choose to do it yourself. We had a lovely warm welcome from the family and got lots of tips as to where to go, what to do. Severine even sent Facebook links as tips which was a lovely touch. You do need a car as the property is elevated (hence the great view) but there are also some very famous cycle routes for Tour de France fans literally at the bottom of the drive! Very handy for getting to the shores of lake annency when you fancy a bit of a dip, some kayaking, pic in etc etc etc. great, long, flat cycle routes too if you're not quite TdF standard. Good supermarkets and fuel available in Faverges. All in all a lovely break in a lovely location. The house was very spacious and had everything we could possibly of wanted. Perfect for our 5 year old boy when we didn't want to venture out there was enough for him to do with the slide and swings and spacious garden, even jigsaws and games that we could of used. The kitchen was very equipped and enjoyed some home cooked food. The area was perfect for what we wanted, away from the busy town of Annecy but only a 5 minute drive to the bottom of the lake. So much around to do which Séverine was most helpful with advising on where to go and explore. The Alps are beautiful and I would most definitely visit again in the future. This mountainside home has beautiful views of the surrounding valley and mountains, and it is well situated for exploring the surrounding region. (We did day trips as far away as Chamonix, about two hours away, to see Mont Blanc. If you travel there, we'd recommend also visiting Les Houches, an animal park whose view of the Alps is even more spectacular than the one in Chamonix. We visited the park and Chamonix on a separate days, but the two could be combined if you got an early enough start to the day. We combined our trip to Les Houches with a visit to the gorge at La Diosaz, which was spectacular; we enjoyed it even more than the also-worth-visiting Fier, with its gorge.) The property itself is spacious and clean, and the owner is very responsive from the moment of booking through final departure. A couple of things that we wish we had known in advance: 1) Traffic on the west bank of Lake Annecy is very heavy, significantly delaying our travel time on several occasions, including our arrival. Although the east bank is a more difficult mountain drive (compared to the flat west bank), we strongly recommend that you use it instead if you do not like being delayed by crawling, even stopped, traffic. 2) Although the rental is located very close to nice walking trails, it is not particularly well situated for taking a casual evening stroll because you cannot walk very far before coming to a windy mountain road with speeding drivers. But if you are willing to drive a very short distance, there are plenty of opportunities for walking. Food shopping also requires a drive, but there is an excellent supermarket that is less than ten minutes away, and the Huit a Huit, along the east side of the lake, is worth the somewhat longer drive (about 20 minutes) for the excellent selection of cheeses and fruit. If you are looking for a high-quality rental in the Haute-Savoie, this property is an excellent choice. 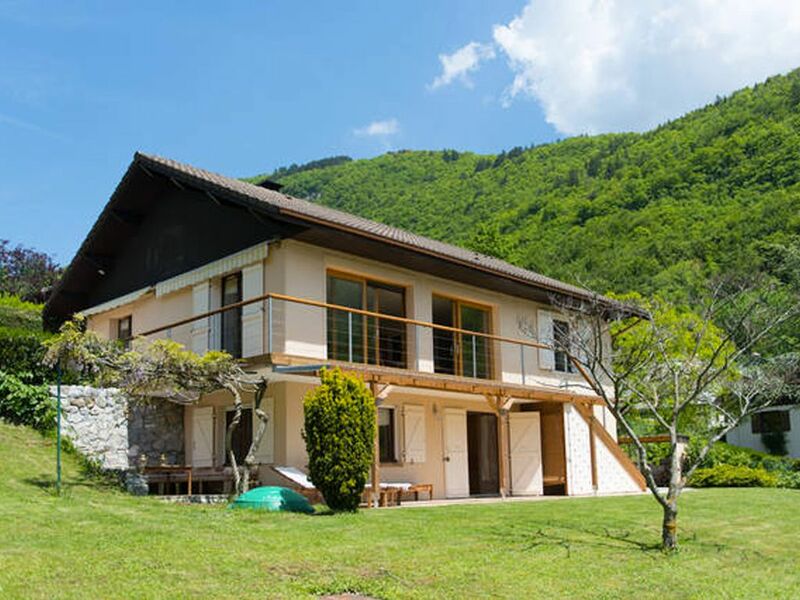 Situated between lake and mountains, this cottage promises a holiday with many activities golf 1.5 km, sailing, water skiing, pedal boats, beaches in Annecy (6 km), cross-country skiing, snowshoeing, paragliding Montmin (6 km). Downhill skiing and cross practiced in La Sambuy, 17 km. Les draps sont fournis ainsi que les serviettes de toilette. Supplément de 80 euros pour ménage final. Taxe de séjour à payer en plus : 1,30cts par personne et par nuitée (sont exonérés les enfants de - de 18 ans).